Rapid Drug Detox can help detox you from Embeda. Embeda is a combination of morphine and naltrexone marketed by Alpharma Pharmaceuticals LLC. The medication is used to treat moderate to severe pain. Embeda consists of an extended-release morphine capsule with an inner core of naltrexone hydrochloride, an opioid antagonist that prevents the body from responding to the drug. The naltrexone core simply passes through the body if Embeda is taken as directed. But if the patient crushes or chews the capsule, the naltrexone escapes and reverses the effects of the morphine and can throw the person heavy withdrawal. Embeda is used in the treatment of constant, long-term pain. Embeda belongs to a group of medications called narcotic analgesics, which are pain medicines. These medications act on the central nervous system to relieve pain. Embeda is highly addictive and tolerance to the drug is built up quickly. Many users experience side effects from Embeda in pursuit of the endlessly-increasing dose required to achieve euphoria. These may include shallow breathing, slow heartbeat, impaired thinking and reactions, fainting, confusion, seizure, loss of appetite, itching, jaundice, blurred vision, low blood pressure, sweating, extreme sleepiness and even heart attack. Embeda withdrawal can be a painful process particularly after heavy use. Symptoms are typically experienced within hours of stopping the use and can last quite some time depending on the intensity of Embeda use. During the beginning stage of withdrawal, a person may feel restless or nauseous progressing to abnormal breathing, slowed heartbeat, sweating or loss of consciousness. Symptoms may also include: muscle aches, vomiting, diarrhea, irritability, anxiousness, dehydration and thoughts of suicide. 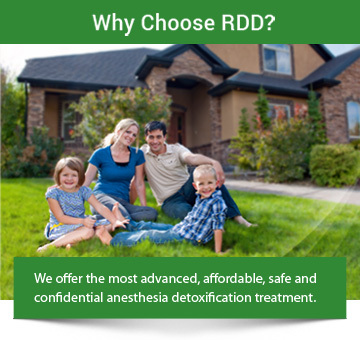 The RDD Method™ for Embeda detoxification under anesthesia is a medical procedure that eliminates most of the withdrawal symptoms. During the procedure the patient is given medication to relax and then put under light, general anesthesia for approximately 60 minutes. Following the procedure, recovery begins under direct medical supervision. The patient’s vital signs and overall physical and mental reactions to these medications are closely monitored during the detox procedure. In the days that follow, the patient often sleeps more than usual. Administered by professionals as part of a long-term drug-addiction recovery strategy, The RDD Method™ is significantly more effective than other courses of Embeda addiction treatment. How do I know if I am addicted to Embeda? A.Short-term users may require a detox program in order to successfully discontinue use of the drug, because of Embeda’s addictive traits. Addicts typically require higher doses of the drug and experience cravings for Embeda between doses. Talking to a trained detox or medical professional is the right first step in choosing the appropriate program. Call us at 1-888-825-1020 or contact us if you’d like to learn more. How long does Embeda detox take? A.The detox process for Embeda varies in length depending on the pattern of typical use and on individual differences. The most severe withdrawal symptoms occur during the first several days after discontinuing use of the drug making it important to seek immediate professional help from trained Embeda detox professionals. A.While recovery from Embeda addiction can be painful; the right procedure greatly reduces discomfort. Anesthesia Embeda detox is a procedure that is effective at reducing the pain normally associated with Embeda detox. How do I choose a Embeda-detox program? A.Call us at 1-888-825-1020 or contact us to learn more about how we can help you overcome Embeda addiction.